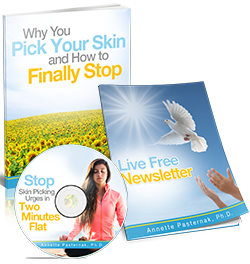 The author(s) and publisher(s) of StopSkinPickingCoach.com and the accompanying resources and materials have used their best efforts in preparing this site. The author(s) and publisher(s) of StopSkinPickingCoach.com make no representation or warranties with respect to the accuracy, applicability, fitness, or completeness of the contents of this StopSkinPickingCoach.com. The information contained in this site is strictly for educational and informational purposes and are solely the opinions of the author(s) and publisher(s). Therefore, if you wish to apply ideas, information, products, or anything else found in StopSkinPickingCoach.com, you accept full responsibility for your actions and the results of those actions. The author and publisher of StopSkinPickingCoach.com disclaim any warranties (express or implied), merchantability, or fitness of materials expressed for any particular purpose. The author and publisher shall in no event be held liable to any party for any direct, indirect, punitive, special, incidental, health or other consequential damages arising directly or indirectly from any use of this material, which is provided as is, and without warranties of any kind. As always, the advice of a competent legal, health, tax, accounting or other applicable professional should be sought before using any materials or products found here on StopSkinPickingCoach.com or elsewhere. 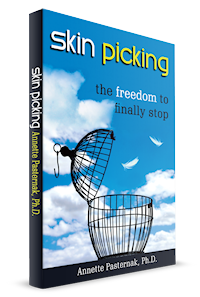 The author(s) and publisher(s) do not warrant the performance, effectiveness or applicability of any site or sites listed or linked to on StopSkinPickingCoach.com. Materials in StopSkinPickingCoach.com are Copyrighted and all rights are reserved. Text, graphics, databases, HTML code, and other intellectual property are protected by US and International Copyright Laws, and may not be copied, reprinted, published, reengineered, translated, hosted, or otherwise distributed by any means without explicit permission. All of the trademarks on this site are trademarks of StopSkinPickingCoach.com or of other owners used with their permission. The materials in this site are provided “as is” and without warranties of any kind either express or implied. StopSkinPickingCoach.com disclaims all warranties, express or implied, including, but not limited to, implied warranties of merchantability and fitness for any particular purpose. StopSkinPickingCoach.com does not warrant that the functions contained in the materials will be uninterrupted or error-free, that defects will be corrected, or that this site or the server that makes it available are free of viruses or other harmful components. StopSkinPickingCoach.com does not warrant or make any representations regarding the use or the results of the use of the materials or products in this site in terms of their correctness, accuracy, reliability, or otherwise. You (and not StopSkinPickingCoach.com assume the entire cost of all necessary servicing, repair or correction. Applicable law may not allow the exclusion of implied warranties, so the above exclusion may not apply to you. Under no circumstances, including, but not limited to, negligence, shall StopSkinPickingCoach.com be liable for any special or consequential damages that result from the use of, or the inability to use, the materials in this site, even if StopSkinPickingCoach.com or a StopSkinPickingCoach.com authorized representative has been advised of the possibility of such damages. Applicable law may not allow the limitation or exclusion of liability or incidental or consequential damages, so the above limitation or exclusion may not apply to you. In no event shall StopSkinPickingCoach.com’s total liability to you for all damages, losses, and causes of action (whether in contract, tort, including but not limited to, negligence or otherwise) exceed the amount paid by you, if any, for accessing this site. Facts and information at this website are believed to be accurate at the time they were placed on the website. Changes may be made at any time without prior notice. All data provided on this website is to be used for information purposes only. The information contained on this website and pages within, is not intended to provide specific legal, financial, health or tax advice, or any other advice, whatsoever, for any individual or company and should not be relied upon in that regard. The services, product, and information described on this website are only offered in jurisdictions where they may be legally offered. Information provided in our website is not all-inclusive, and is limited to information that is made available to StopSkinPickingCoach.com and such information should not be relied upon as all-inclusive or accurate. Statements on StopSkinPickingCoach.com have not been evaluated by the Food and Drug Administration or any other governing body. As always readers should consult appropriate health professionals as necessary on any matter relating to their health and/or well-being before taking any action of any kind. Individual results of the use of the products, or information found on StopSkinPickingCoach.com will vary. Statements mentioned are to be considered anecdotal with no expressed or implied results byStopSkinPickingCoach.com. Any and all information contained on StopSkinPickingCoach.com or any StopSkinPickingCoach.com related sites, articles or materials are not intended to take the place of medical advice from a health care professional. Any action taken based on the contents found in StopSkinPickingCoach.com or any StopSkinPickingCoach.com related sites, articles, materials, products or information is to be used at the sole discretion and sole liability of the the person or persons visiting StopSkinPickingCoach.com. Readers of any information found on StopSkinPickingCoach.com should always consult appropriate health professionals on any matter relating to their health and well being before taking any action of any kind concerning health related issues. Any information or opinions provided here or in any StopSkinPickingCoach.com related articles, materials or information are believed to be accurate and sound, however StopSkinPickingCoach.com assumes no liablitiy for the use or misuse of information found on StopSkinPickingCoach.com. Niether any personnel or associates of StopSkinPickingCoach.com will in any way be held responsible on behalf of any reader who fails to consult the appropriate health authorities with respect to their individual health care before acting on or using any information or products found on StopSkinPickingCoach.com, and niether the author or publisher of any information found on StopSkinPickingCoach.com will be held responsible for errors or omissions, or use or misuse of the information or products found on StopSkinPickingCoach.com. The owner of this site is not necessarily affiliated with sites that may be linked to this site and is not responsible for their content. The linked sites are for your convenience only and you access them at your own risk. Links to other websites or references to products, services or publications other than those of StopSkinPickingCoach.com and its subsidiaries and affiliates at this website, do not imply the endorsement or approval of such websites, products, services or publications by StopSkinPickingCoach.com or its subsidiaries and affiliates. Certain names, graphics, logos, icons, designs, words, titles or phrases at this website may constitute trade names, trademarks or service marks of StopSkinPickingCoach.com or of other entities. The display of trademarks on this website does not imply that a license of any kind has been granted. Any unauthorized downloading, re-transmission, or other copying of modification of trademarks and/or the contents herein may be a violation of federal common law trademark and/or copyright laws and could subject the copier to legal action. You agree to treat as strictly private and confidential any Subscriber Code, username, user ID, or password which you may have received from StopSkinPickingCoach.com, and all information to which you have access through password-protected areas of StopSkinPickingCoach.com’s websites and will not cause or permit any such information to be communicated, copied or otherwise divulged to any other person whatsoever. To the extent you have in any manner violated or threatened to violate StopSkinPickingCoach.com and/or its affiliates’ intellectual property rights, StopSkinPickingCoach.com and/or its affiliates may seek injunctive or other appropriate relief in any state or federal court in the State of California, and you consent to exclusive jurisdiction and venue in such courts. If a dispute arises under this agreement, we agree to first try to resolve it with the help of a mutually agreed-upon mediator in the following location: Los Angeles County. Any costs and fees other than attorney fees associated with the mediation will be shared equally by each of us.